Science is not just for scientists. There are ways for everyone to be involved and contribute, and citizen science is opening the door. Citizen science is defined by the involvement of the public in scientific research – through either community-driven research or global investigations. A citizen science project can involve one person or millions of people collaborating towards a common goal. All fields of science can benefit from this form of public engagement. 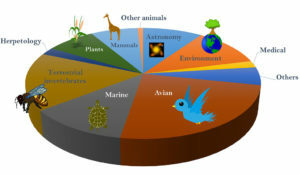 So far citizen science projects have been involved within the fields such as ecology, astronomy , medicine, computer science, psychology, genetics, and more. Typically citizen scientists are involved in the categories of data collection, analysis, or reporting. Over the past few decades, the massive collaborations that have arisen from citizen science collaborations have promoted investigations on both national and international scales. This sort of citizen science collaboration can lead to discoveries that a single scientist could never achieve on their own. Participants use the same protocol as the scientists. Data is of of high quality and can be combined such that scientists can generate conclusions. A wide community of scientists and volunteers can work together and share data which everyone (the public and scientists alike) then has access to. Citizen science, if utilized correctly, has the potential to significantly augment scientific research. Involving more people who are science curious and motivated will help bridge the gaps in manpower that currently exist within some scientific ventures. For example, there are many challenges that come with collecting large samples of data. However, with today’s interconnected world we can now leverage the thousands of potential citizen scientists from around the globe to remotely contribute and participate in the research process. With citizen science, we can increase public engagement and ideally cultivate a citizenship that is knowledgeable and unafraid of the scientific enterprise. As a result, the hope is that a more informed public, and more importantly a more involved public, will help push for valuable changes in science policy. Although citizen science has great potential, we must also consider the limits of its reach and whether it is the tool we imagine it to be. A recent research article found that “…mainstream scientist-led projects…may appeal more to a narrower type of audience, that is, one that is already paying attention to and is supportive of science”. This means that if we want to utilize citizen science as a tool for public engagement, we will have to consider more ways to reach those potential citizens who are most likely NOT to engage in the scientific process. Check out this TEDTalk and the episode on citizen science from the NPR TED Radio Hour. If your research could benefit from an internet-based citizen science project, check out Citizen Science Alliance. Looking to become a citizen scientist? Scientific American, Citizenscience.gov and SciStarter have more information on current research studies that need your help! Peer edited by Matthew Varga.